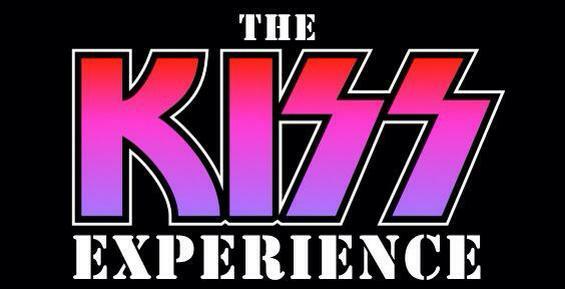 The KISS Experience rock and rolled all night at The Casablanca Resort in October! KISS. The name alone conjures up a very specific era for most fans. The original fearsome foursome. Paul Stanley, Gene Simmons, Peter Criss, and Ace Frehley. Many diehards cling to this lineup exclusively and may even dismiss virtually any works released after the revered Alive II. 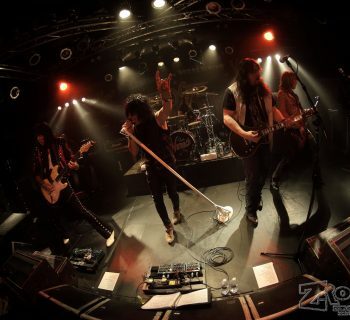 I've seen roughly a dozen KISS tribute bands in person over the years, going as far back as seeing Cold Gin (the tribute to the band that current Ace Frehley replacement Tommy Thayer was once in) once or twice in North Hollywood, CA in 1993, as well as many clips of others on YouTube. I won't name names here to be fair, but I've witnessed groups mining this territory that verge on parody, others doing songs from various releases of theirs (makeup AND non-makeup years) all the way up to and including studied re-creations true to a specific era. Sometimes you see one where one or two of the members have got it down while the others need a bit or sometimes dire help, other times all four miss the mark (it happens), but rarely do you see and hear one that nails it. And I mean: has the makeup designs spot on, the period costumes that match, vintage instruments, stage banter, mannerisms, NYC accents, pyro, lights, fog, blood spitting, stage set, lit up band logo, the vocals reminiscent of KISS' live show (not necessarily studio-quality vocals), AND the instrumental chops. THAT, my friends, is an elusive combination. That takes skill, rehearsal, preparation, dedication, experience, time and money to pull off. Many times it requires having played in more than one of these combos over the years to find the right players committed to bringing such a masterpiece to life. Some people joke around about a band doing KISS better than KISS. That's obviously not possible. But what IS possible is playing a full show celebrating a time period in their storied 41 year career without breaking character. That is what few do. 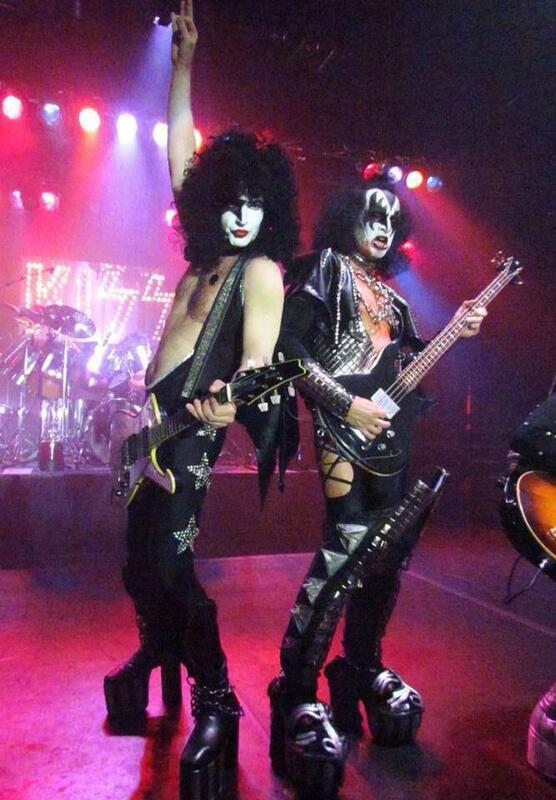 The KISS Experience is NOT just another band with the greasepaint and Halloween costume quality-outfits plowing through assorted greatest hits and perhaps two or three obscure album tracks of NYC's favorite sons. Nope. These guys are intent on representing KISS at the triumphant peak of their powers, the '77/'78 Love Gun/Alive II era. The KISS Experience rocking the stage in Mesquite. Photo by Jerry Scott Adler. Starting with pre-recorded audio of media clips from back in the day, while the band's logo scrolled down the video screens on either side of the stage, the capacity crowd of roughly 700 was lulled into yesteryear. Anticipation was running high as I heard comments of the patrons filling the showroom. These were fans that entered to win tickets for a private party and concert that 95.9 The Hawk, a Southern Utah classic rock radio station, had promoted for better than a couple of months. So in a way it was a special event. As the curtain lifted to the familiar opening notes of Love Gun's "I Stole Your Love," it was clear that the faithful were being won over by these guys. Founding member Gary Stevens portrayed his best Starchild in every way, while co-founding member Troy Lynn Powell dialed in The Catman. I'd seen two different incarnations of this band in the past three years. Why the lineup change? Well, sometimes a member quits or simply isn't available at the time. In any case, I'd been eagerly awaiting seeing Artie Lemos channel The Demon since his reputation preceded him, and he didn't disappoint whatsoever. Neither did relatively new KISS tribute musician Matt Schroeder, who wasn't about to let his rendition of The Spaceman be the weak link here. Setlist for this evening of rock and roll. 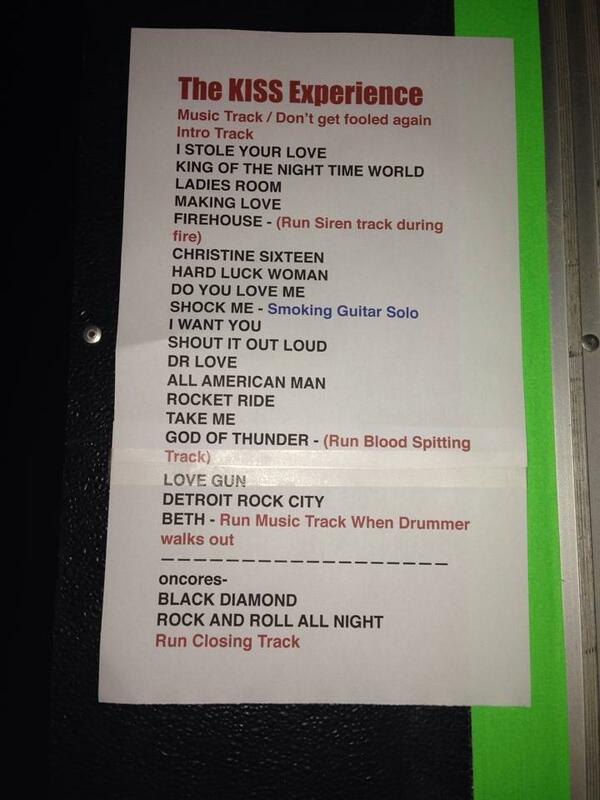 The setlist stayed true to KISS' second live album with just a few exceptions. Some tracks off of that double live opus were left off in favor of a few on their breakthrough first live LP, while others were replaced by a deep cut off of Rock and Roll Over. Two studio tracks culled from side four of II, "All American Man" and "Rocket Ride," were obviously given the live treatment, while staying true to the recorded versions. Once again, it was like going back in time, which I truly appreciated because my parents didn't let me go to ANY concerts in '78, and KISS was at the top of that list for this Catholic-raised schoolboy. Pulling off a live Paul Stanley is not an easy task. You need the right height, vocal inflection and range, Queens accent, accurate face design, hairdo, the fabled rose tattoo, chest hair, costume layering, mannerisms, guitars, body build, and swagger all rolled into one to come off as the iconic frontman. Otherwise, the whole band can come off a bit off-kilter. Gary started in '88, and to my knowledge, fronted the first KISS tribute ever in Detroit several years before it was in vogue to do so. Other acts he was part of include Strutter and, more notably, Hotter Than Hell, the band chosen by Gene and Paul to wear THEIR Love Gun-era costumes for the Detroit Rock City movie, as well as to stand in for them. Aside from that, he was instrumental in the Original KISS Army, as well as the Kentucky-based KISS Army. In short, he's been the go-to PS. Stevens delivered the goods at this show, a few strained vocal moments aside. 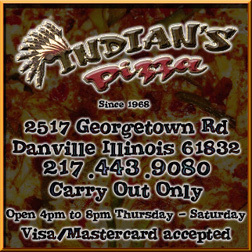 Overall package, a 9.0, which is considerable taking into account all ingredients necessary. Gene. Hmmm. Convincing growling vocals w/ the right range? Check. Fire breathing skill? Unparalleled. Mannerisms. Down. 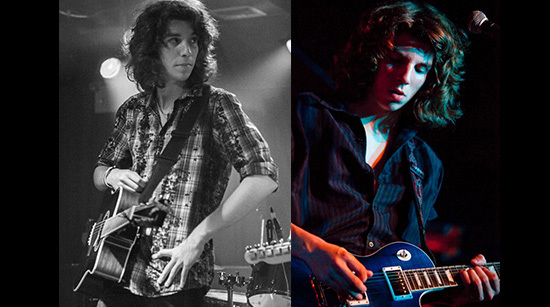 Among the top three Simmons impersonators I can think of. Frehley. Not Thayer. Ace. The one and only. How did Matt measure up? From the costuming down to the chops I'm thinking that Paul Daniel Frehley would've given two trademark thumbs up. And now Peter. What can be said about someone who has been playing this part for years in nationally touring acts like his cohort Gary? He's honed his craft. Troy sang Pete's parts live better than Criss was known to usually. And the drumming was up to par as well. All expected instrumental solos were executed deftly. Guitar leads and rhythms were traded off like the original band. The KISS Experience rocking Mesquite! Are there other KISS tributes that play more regularly than this one? Sure. However, I feel strongly confident that with their lineup solidified and new promo materials, as well as a newfound agent, that you'll be seeing these boys in your town more often. And their roughly two-hour show will certainly be worth the ticket price. As with other shows I've reviewed and highly recommended, this one is no exception. When The KISS Experience announces their next date and if you live close, re-arrange your schedule and pony up the cover charge. It'll be 1978 all over again and you'll leave satisfied. You wanted the best? You just may forget about the rest. 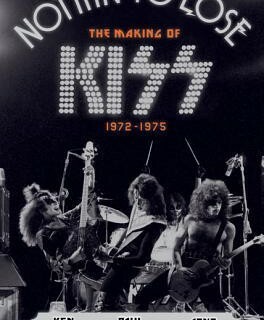 KISS Nothin' to Lose - Book Chronicles the Band's Early Formative Years!